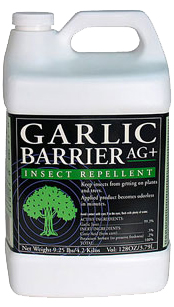 Garlic Barrier repels almost every kind of insect from all plants. It is completely safe to use on everything you grow and will leave no garlic taste when used on vegetables. The garlic smell disappears within minutes, even when used on houseplants, but the effect will remain for at least 6-8 weeks. Garlic Barrier should be applied before a problem exists for best results, as it is a repellent not an insecticide. Garlic Spray comes in gallons which dilute 100:1.